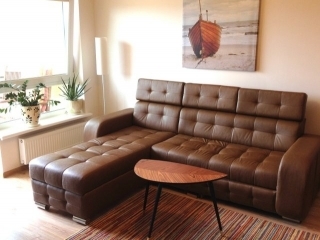 Excellent, fully furnished two-room apartment in Palanga. The flat is situated on the fourth floor of a new building. Apartments are orientated to the west . Bright and comfortable apartment with modern and fully equipped kitchen (includes dishwasher, stove, oven, coffee machine, refrigerator, etc.) and bathroom (washing and drying machines). The apartment has small balcony with outdoor furniture for your morging coffee ar late drink. The apartment is in a quiet area. In "Ruth" apartments can comfortably rest for 3-4 persons.